Find out what’s happening across the state! We’ve got the inside scoop on sales, shows and events! Happy Wednesday! 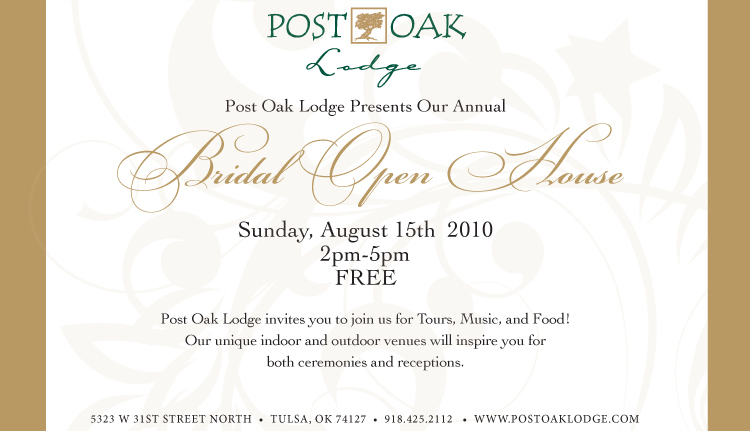 Don’t miss the free Bridal Open House happening at Post Oak Lodge on August 15 from 2-5 p.m.! It has breathtaking views of Tulsa’s Osage Hills and offers a selection of beautiful indoor and outdoor venues. Post Oak Lodge is the perfect spot for your ceremony and reception; this is your chance to check it out! Be sure to stop by to enjoy tours, music and food! For more information, visit their website. Enjoy! Girls, get ready… Naifeh Fine Jewelry is having their 6th annual storewide sale! Today through August 21 save up to 75% on select diamond jewelry, loose colored gemstones and pearls, bridal sets and wedding bands, diamond fashion jewelry and watches. Find the best selection if you shop early! Don’t miss out on these huge savings, head over to Naifeh Fine Jewelry now! Facchianos Bridal in Tulsa is having an amazing Fall in Love sale August 9 from 10 a.m.- 6 p.m.! Who doesn’t love a sale?? This full service bridal salon carries beautiful designer gowns and dresses for you and your bridal party. We’re sure you’ll find what you’re looking for! Stop by Facchianos where hundreds of gowns, accessories, and more will be on sale! Enjoy! We are suckers for a good cause — especially when it comes to animals! So although this is not really wedding related, we just had to share this event! Beginning this Friday, August 13 through Saturday, August 14, stop by Mitchell’s Jewelry in Norman for The Dog Days of Summer Special Event. A percentage of all sales during the Dog Days of Summer will go to A New Leash On Life — a very worthy organization! You’ll definitely want to check out the Best In Show collection while you’re there. Bring your pups to share in the fun! If you’re thinking about including your pooch in your wedding ceremony, this might be the perfect opportunity to bedazzle them! You can also pick up dog tags and charms — engraving is free! Free pet portraits by a local artist will take place Friday the 13th from 4 to 7 pm and Saturday the 15th from 1 to 4 pm. This might also be the perfect time to look for some bling to add to your wedding attire! Enjoy the Dog Days of Summer! « Previous Post: We Love Pets!